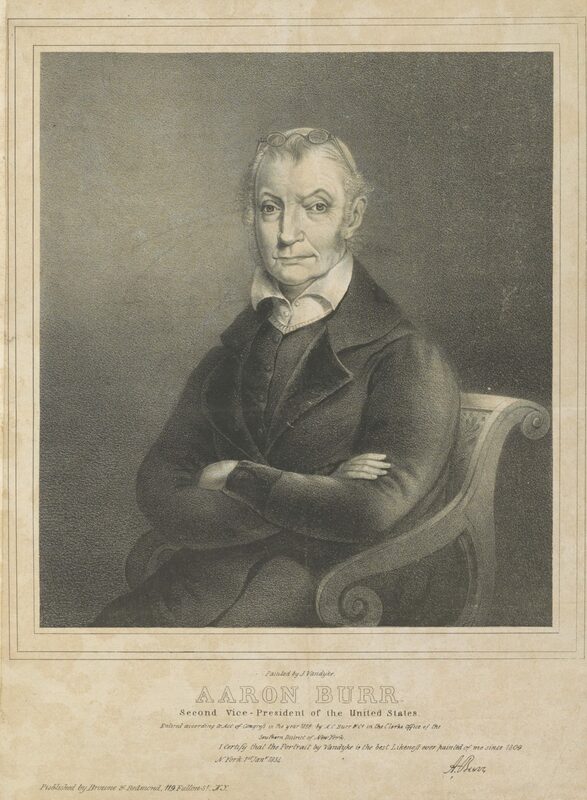 Sara Gabbard: Please explain Clay’s early legal representation of Aaron Burr. Did the relationship cause him later regret? John Marszalek: In the early 19th century, Henry Clay and Aaron Burr were both young up-and-comers in American politics. Yet, Clay became one of the most famous of all 19th century Americans, while Burr nev­er lived down the accusations that he unfairly killed Alexander Hamil­ton in a duel and later tried to incite a conspiracy against the stability of the United States. Clay was seen as the symbol of the Union, while Burr has come down in history as someone who tried to destroy it. In late 1804 Burr resigned his place as Thomas Jefferson’s vice president be­cause he worried about being found guilty of murder for killing Hamilton in a July 11 duel. This occurrence and his ability to alienate a wide variety of peo­ple caused him to travel to the West, rather than remain in the East. People in the West liked him, so they readily listened to him talk about the “grand expedition” of splitting off the West from the rest of the United States. Burr had met Henry Clay in Lexing­ton, Kentucky, and the latter agreed to defend him in court. A newspa­per owned by Supreme Court Justice John Marshall accused Burr, even Clay, and a large number of other Democratic Republicans in the West of treason. Henry Clay then decid­ed not to defend Burr because he had just been elected by his state to the US Senate. But then he accepted Burr’s offer to pay him more to stay on, and he even signed an oath swear­ing his innocence. Clay stayed on. When Clay traveled to Washington and found that Jefferson’s supporters hated Burr as much as the Federalists did, he began to worry. Then Presi­dent Thomas Jefferson showed him a letter which he said proved Burr’s guilt, and Clay believed him. He now saw Burr as being guilty as charged. He never forgave Burr for what he was now convinced was Burr’s lie. In 1815, the two men accidentally met, but Clay, still angry, refused to shake hands with his former client. They never met again. Clay’s legal in­volvement with Burr resulted in his being implicated in the controversy when he later ran for the presidency. 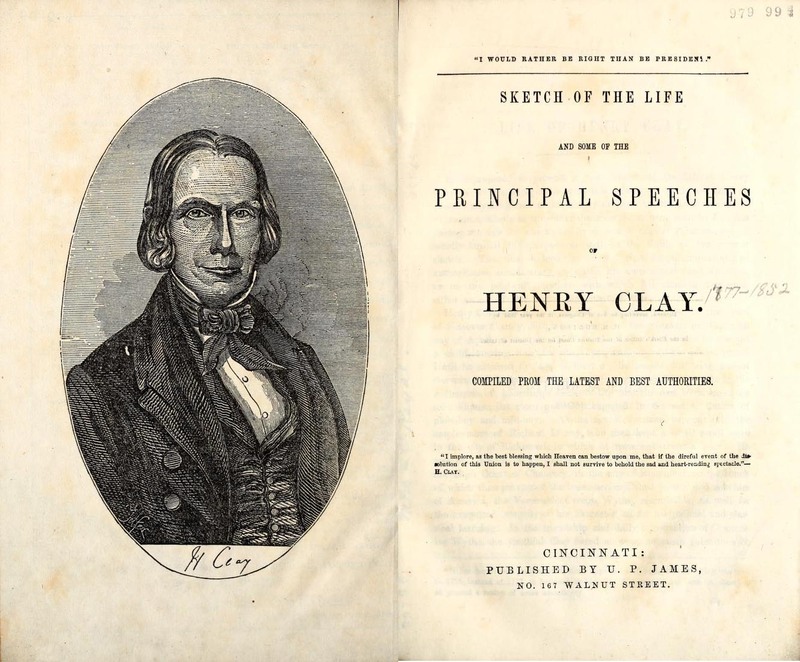 Henry Clay, one of American’s great politicians, paid the price for his re­fusal to see the danger his political connection with Burr would cause him. SG: What was Clay’s role at the Treaty of Ghent? JM: Henry Clay earned the nickname “War Hawk” for his leadership of those congressmen of similar philosophy hoping to lead the United States into the “War of 1812.” When the war came to an end, however, he, along with four other Americans: Albert Gallatin, John Quincy Adams, Jonathan Russell and James A. Bayard, was named to the peace commission. Along with British commissioners, these Amer­icans brought the War of 1812 to an end: actually to the “status quo an­tebellum.” As a war hawk, Clay had pushed for the desires of the West. At Ghent he forthrightly opposed John Quincy Adams and Eastern in­terests and refused to go along with giving England the right to navigate the Mississippi River in return for fishing rights for easterners. He also opposed giving England any rights to deal with the Indians in the West. SG: Clay’s relationships with so many national leaders offers almost a mini-US history class: Please comment on his experienc­es with and feelings about (the following). JM: John Quincy Adams – Henry Clay served on the Treaty of Ghent negoti­ations commission and stood in oppo­sition to John Quincy Adams’ defense of easterners. Later, however, during the presidential election of 1824, he ended up throw­ing his support to Adams, allegedly, for receiv­ing the post of secretary of state in the New En­glander’s cabinet. One of his op­ponents, Andrew Jackson whom he would battle for al­most the rest of his life, called the agreement “the corrupt bargain,” and hung it around Clay’s neck for the rest of his political career. John C. Calhoun – John C. Calhoun was another war hawk, but com­ing from South Carolina he was hardly the nationalist that Clay was. The result was that, although they were allegedly in the same party, the two men were in constant con­flict. Clay and Calhoun contested the so-called “tariff of abominations” by fighting over the right of nullifica­tion. Their different beliefs resulted in their opposition to one another, yet their mutual opposition to Andrew Jackson remained even stronger. 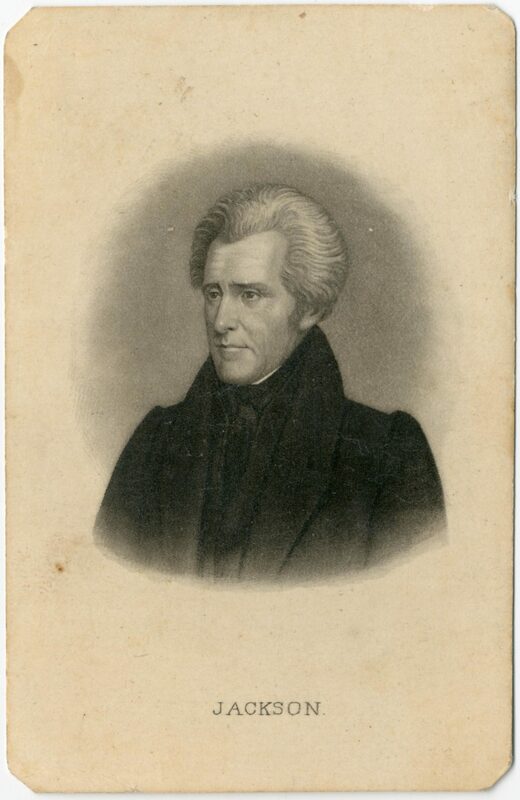 Andrew Jackson – Like Henry Clay, Andrew Jackson was one of the lead­ing figures of the early 19th century. Actually, Jackson was more successful because he was twice elected presi­dent of the United States, while Clay ran three times and lost each time. Clay was a great orator, philosophi­cal rather than straightforward, and a leading member of the House of Representatives and US Senate. Jack­son was a famed military leader and appealed to the masses of Americans. Jackson was a great opponent of the Bank of the United States, while Clay supported the concept as part of his American System. Clay was the “Great Pacificator,” while Jackson took forth­right stands on a variety of the era’s issues. Jackson and Clay were both important contemporaries, but they were poles apart in their attitudes. James Madison – The major differ­ence between James Madison and Henry Clay was their completely op­posite stands on the desirability of war between the United States and Great Britain. Madison opposed war, while Clay called for it. During the war itself, the two men stood shoulder to shoulder, determined to defend the nation they both sup­ported, although in different ways. James Monroe – Henry Clay had many claims to fame; one of the most import­ant was his support for what came to be called “the American System.” Clay es­poused federally financed internal im­provements like canals and roads, a high protective tariff, and later a Bank of the United States. In addition, Clay wanted to make the United States the leader of the nations in the western hemisphere, i.e. Latin America. As a Democratic Re­publican, Monroe opposed a federal role in American economic life and op­posed an American role in Latin America. John Randolph – In 1826, John Randolph was on the floor of the US Senate and called President John Quincy Adams and his secretary of state Henry Clay, a “puritan with the black leg.” What made this comment so awful was that “black leg” was a fatal disease which affected livestock. Clay was insulted and for­getting that Senators could say awful things on the floor of that body without fear of being called to account, chal­lenged Randolph. The Virginian remem­bered the exception, but refused to tell Clay about it. He decided instead that he would not fire at his antagonist. This meant that Clay would certainly kill Ran­dolph. When the two men fired on one another, Clay missed (accidentally) and Randolph (on purpose). It now came time for the second shot, and Randolph simply fired in the air. Clay then stopped the duel, and the two men left the field of honor unscathed and friendly again. SG: What do you consider to be Clay’s great accomplishment(s) as Speaker of the House? JM: Henry Clay played a major role in changing the power of the Speaker of the U.S. House of Representatives from simply deciding what bills came up at what time, and, instead, increas­ing the Speaker’s political power. The result was that the Speaker of the House became much more powerful than the majority leader in the Senate. What the Speaker did was to look at the bills that were pending and as­sign them to specific committees, the members whom he had himself ap­pointed. He also controlled the time for debate and made sure that he re­tained the right of the speaker himself to speak whenever he wished, by turn­ing the House into a committee of the whole. Significantly he made all such changes in a way that did not seem to alienate the members and they went along with him. It was no accident that he was Speaker of the House for a total of ten years, the longest tenure of any 19th century Speaker. SG: The topic of slavery obviously cast a giant shadow over the era of Clay’s political life. What were his feelings on the subject? JM: Henry Clay did not approve of slavery, although he owned slaves himself. He opposed abolition be­cause he saw it as a danger to the con­tinuation of the Union, but he found slavery to be abhorrent. So, he found himself in the throes of a dilemma. He tolerated the institution in order to preserve the Union. His method of getting around this problem was to support the concept of coloniza­tion. The best way to end slavery and preserve the Union, he believed, was through his leadership of the Ameri­can Colonization Society. Purchase freedom for American slaves and then send them back to Africa where they might live a decent life. In fact, colo­nization did not work, but Clay saw no other way to handle the matter. 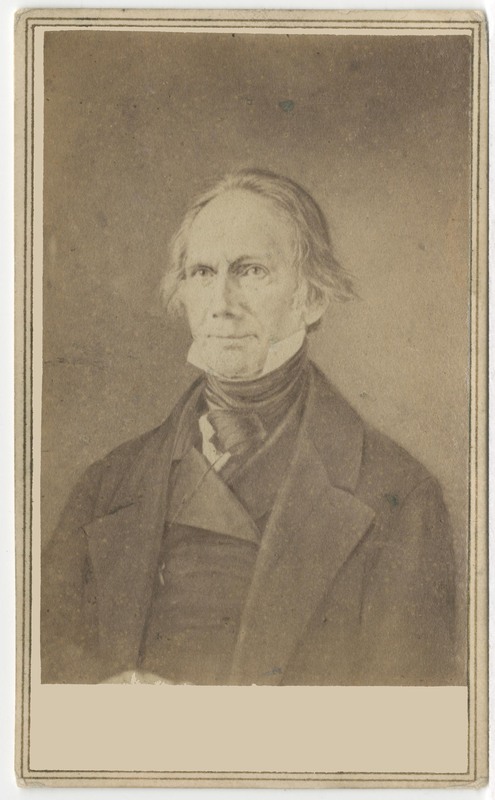 SG: Henry Clay was determined to become President. Why did he fail? At what time was he closest to achieving his goal? country’s leading Whig and national­ist. He strongly supported his Amer­ican System. This was, indeed, one of his problems: he took firm stands in favor of a strong central government, at a time when Andrew Jackson was extremely popular and a believer in state rights. Clay was called “Harry of the West,” but his nationalistic po­sitions were more eastern than western. So, Jackson became the candidate of the West, and bypassed Clay. In 1844 Clay came the clos­est to victory, but he unchar­acteristically made a polit­ical faux pas when he wrote the so-called “Raleigh Let­ter” opposing the annexation of Texas be­cause it might result in war with Mexico. Then he wrote two “Alabama Letters” seem­ingly changing his mind on Texas annex­ation. This flip-flop probably resulted in James K. Polk’s narrow victo­ry. After this, Clay never ran for pres­ident again. He died in 1852. SG: Probably not a fair question, but please give your overall as­sessment of the life and career of Henry Clay. JM: Henry Clay was indeed one of the most significant politicians in all of American history. Consider his career: he was born in 1777 in Virginia during the American Revolution. He moved West to Kentucky and was one of the most significant attorneys of his era. He was a War Hawk, and a commis­sioner during the Ghent Treaty negoti­ations after the War of 1812; he was a powerful orator, and, established the Speaker of the U.S. House of Repre­sentatives as a national leader. He be­came a hero in Latin America, gained the nickname “The Great Pacificator” for his work on the Missouri Compro­mise, the Compromise Tariff of 1833, and the Compromise of 1850. He ran for presidential office three times. And, per­haps, most important­ly, he had a tremen­dous influence on the man usually consid­ered the greatest pres­ident in American his­tory: Abraham Lincoln. Lincoln came from a Whig political back­ground, so he natu­rally placed Clay on the highest pedestal. At one time, he called Clay “My Beau ideal of a Statesman.” Another time, he said that he “almost worshipped Henry Clay.” Lincoln never met Clay per­sonally, but he heard him speak at least once; he voted for him, and in 1844 he not only campaigned for him, but he served as his elector in Illinois. When Lincoln ran for office himself, he fre­quently quoted Clay in his speeches. In his famous debates with Stephen A. Douglas, he quoted clay 41 times. The most famous connection Lincoln had with Clay was his eulogy of the man in Springfield, Illinois, upon Clay’s death in 1852. It was not his greatest speech, but its praise of Clay is obvious. He said: “our country is prosperous and powerful; but could it have been quite all it has been, and is, and is to be without Hen­ry Clay?” He certainly did not think so.